STARFOLD CARD VIDEO…this video is off youtube and you should know that there are no words only music and that it is not in english or in inches measurements, she does however have writing on the screen that kinda helps but I am pretty sure she is working with a piece of 12×12 paper and that is not what my measurements are so the measurements are different, however it will probably be very helpful to watch it first then follow my directions below. It is a rather long video and after you see how to fold it you can just quit or watch to see how she decorates and its much more involved than anything I did. 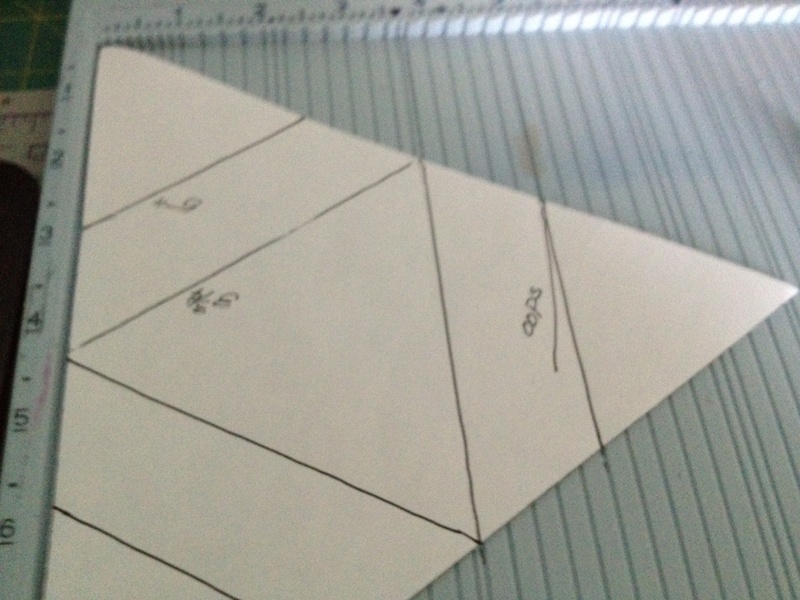 Mark a small pencil mark at 4 1/4 on the 8 1/2 size then lay your paper on a paper cutter and cut a diagonal cut from the each of the points on the 7 1/2″ side of paper and cut up to the 4 1/4 mark you made. 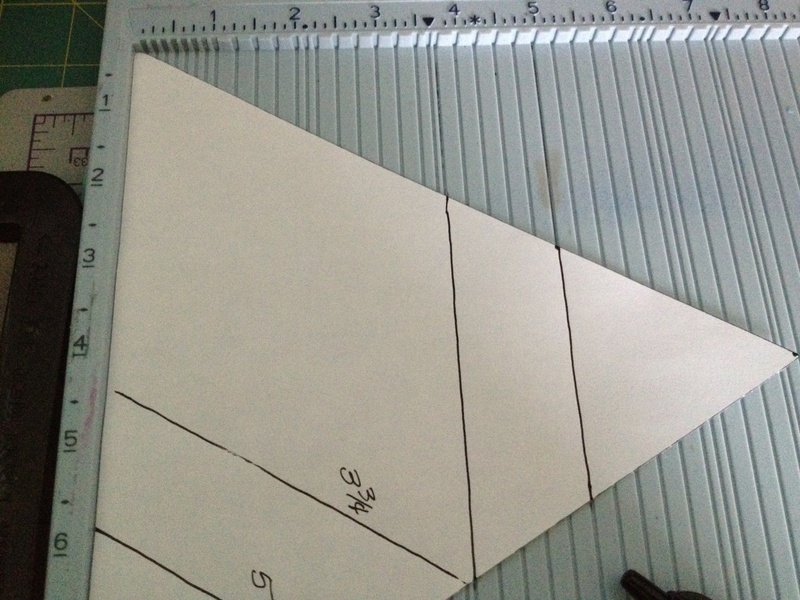 Now you should have a triangle and while it doesn’t seem possible each of the triangle sides will measure 8 1/2 inches. From here the directions are that this will be easier with a SCOR-PAL or some other scoring pad. 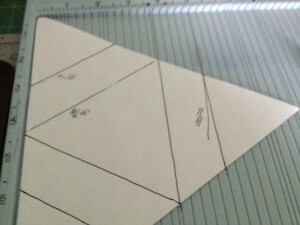 You can however use a ruler and make a pencil tick at the measurements. 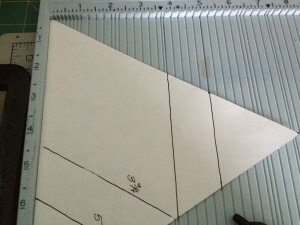 If you are using a ruler be sure to look at how she does it in the video and then use my measurements to make your tick marks and then she uses a paper cutter with scoring tool to make the score lines if you are using the ruler I would just use the ruler and score along the ruler with a bone folder. I don’t do well with swapping the cutting blade for the scoring blade ..tend to get in a hurry and end up cutting it off when I only meant to score it…then the bad words come out. 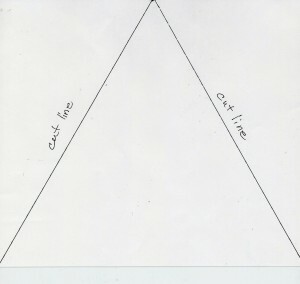 Laying your triangle so that the flat side of any leg is against the left side of the SCOR-PAL and the point is up at the top left corner , score straight down at the 3 and 3/4 mark and again at the 5 inch mark. 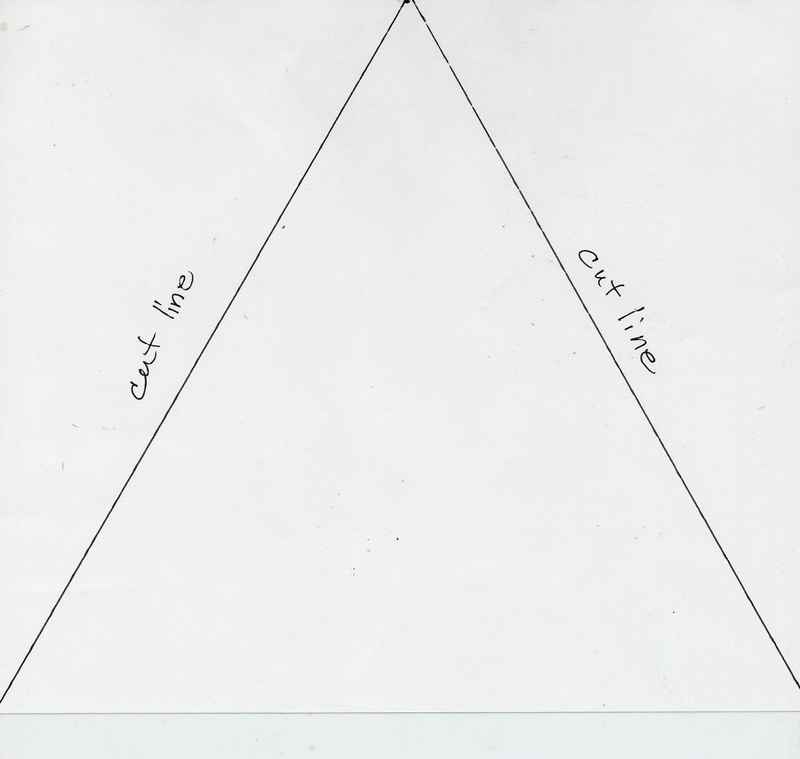 ROTATE the triangle again so flat side is against the left edge of SCOR-PAL and point is up at top left corner and again score at 3 3/4 and also at 5 ..
ROTATE ONE MORE TIME and REPEAT FOLLOWING THE SAME RULES. NOW after all scoring you will see a triangle in the center and you will fold each score mark as follows the 3 3/4 score line is folded in the 5 ” score line is folded out ….repeat with each of he other two and when you get all three folded into center then you have your star to keep it closed gently hold down and pick up one flap and tuck it in under the other so that you create a box top type fold. If you watch the video you will see how that looks. You can then decorate your star points with images or pieces of triangle paper glued on top or if you use a piece of Duplex paper ( that’s paper that has different designs or colors on each side THEY WILL ALREADY BE DECORATED. 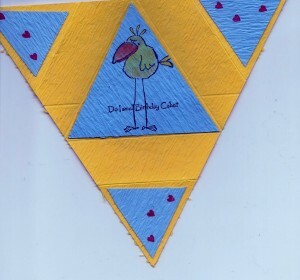 You can still add embellishments to them and if you cut a piece of card stock 3 1/2 inches square you can cut a small triangle to fit into the center by cutting the 3 1/2 inch square the same as you cut the original triangle find the center ( 1/3/4 “) make a tick mark and lay it on your paper cutter and cut from mark diagonal down to the point. Repeat with the other side. 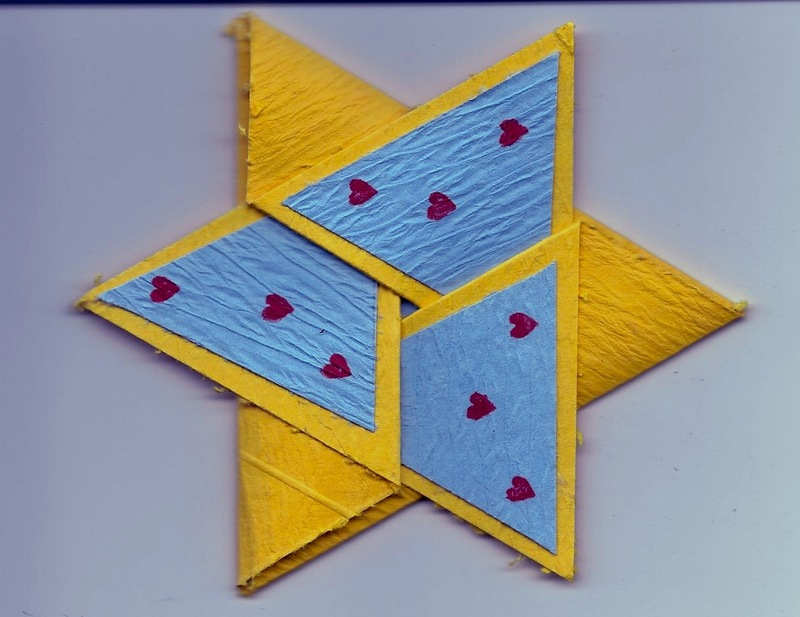 This will create a slightly smaller triangle that will fit inside the STAR. I really really like this fold and again its a great one to cut the triangles in various colors of paper and score them then store them in your sheet protectors so that they are ready to go when you need them…In addition , I would suggest you take a sheet of text paper cut, score and fold it and SAVE IT in the protector so that you can see how to fold it again if you don’t make for a while and forget how it goes. I mentioned early that if you don’t have the SCOR-PAL or similar scoring board you will need to use a ruler and I Highly recommend that you spend the money for a quilting ruler…a) because it has great measurements on it …b) its clear so you can see thru it c) and if you cut against it with an xacto knife it won’t get cut. 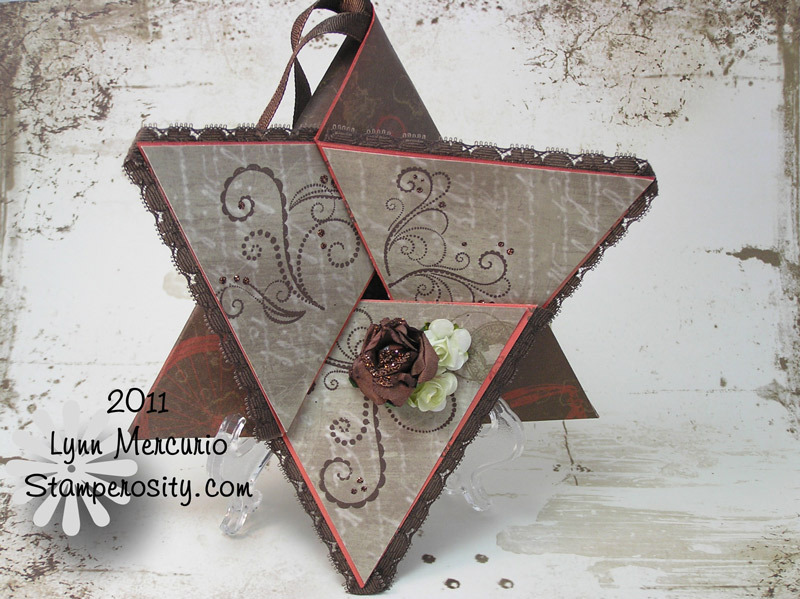 The set that I have linked you with is a good buy and perfect sizes…the 6 x 12 is great for almost any size card you might be working on and the 4 x 8 is also good for a smaller card and the tiny one is great for caring with you in your purse. this is a good buy but you can look at the local store and find a single if you want but I would definitely suggest that it be something x 12..to work with all the paper you have. Please feel free to let me know if you think I could write this easier to understand or if you think there is a better way and I’d love to post your image if you make this card. PS measurements help from Stamping School . This entry was posted in Cards, TIPS/HINTS, Tools by kath. Bookmark the permalink. Very cool! You ARE the folding queen!!! Thanks but I I won’t really earn this title til I make you that fold you sent me…as an actual card not just a scrap..but thanks. Hey, Kath, I absolutely love this card! The way you simplified the instructions is incredible. In just a couple of cuts and a couple of easy scores it all was done. This card has so many possibilities! Thanks, Kath, for the great inspiration. Thanks Janis, good point about Martha Stewart score board. My motto is whatever works!!! Thanks for sharing.